We specialise in working with our partners and major sponsors to tailor the event with innovative promotional opportunities to maximise your brand values. If your focus is targeted towards the travel industry or consumer/end user travel related products - once the goals are agreed - your involvement can be as little or as much as you wish. You can relax in the confidence that - with over 20 years of event experience and unsurpassed production skills - you will be regularly updated with progress reports and your message will be delivered to specification, with the minimum of effort required on your part. 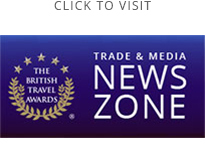 The objective is to dovetail your involvement with the British Travel Awards into your own marketing strategies for the year.